Chief of Department (ret.) Daniel A. Nigro became the 29th Chief to lead the New York City Fire Department on the afternoon of September 11th 2001. A native and life-long resident of New York City, Chief Daniel Nigro entered the Fire Department in 1969 and quickly and steadily rose through the ranks from firefighter to lieutenant, captain, battalion and deputy chief. Daniel Nigro was appointed a staff chief in October of 1994. His vast experience includes service in the boroughs of Manhattan, Queens, Bronx and Brooklyn as well as administrative positions. Nigro served as Assistant Chief of Operations where he was responsible for instituting a Certified First Responder Program which brought, for the first time, fire units into New York City’s Emergency Medical Response. He worked on the merger of EMS and FDNY and became the first Chief of EMS in 1996. From 1997 to 1999 Daniel Nigro was a Citywide Tour Commander in charge of fire and emergency management at major incidents throughout the city. As Chief of Operations (the second highest uniformed rank) from 1999-2001, Nigro oversaw the daily management of all FDNY Units. It is in that capacity that he responded to the tragedy of September 11th, assisting in the Incident Command, surviving both collapses and, upon the death of Chief of Department Peter J. Ganci Jr., assuming the role of Incident Commander that afternoon. As Chief of Department, Chief Daniel Nigro held the highest uniformed position in the Department during its most difficult days and helped to get the Department back on its feet, ready to protect the citizens of this city. Daniel Nigro retired from the Dept. in Sept. of 2002 and was appointed to Fire Commissioner Scoppetta’s Terrorism Advisory Committee. During Chief Daniel Nigro‘s career he earned some of the Department’s most honored and prestigious awards including the Fire Commissioner’s Award for Outstanding Service and the Leon Lowenstein Award. He has been recognized for outstanding service and performance by the governments of New York City, New York State, The United States, Italy (The Order of Merit of the Republic – Cavaliere) and France (Fourragere). 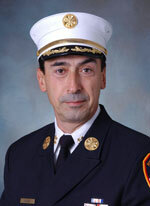 Chief Daniel Nigro was born in New York City on October 11, 1948 and has resided there all of his life. He holds a Bachelor of Business Administration (1971) from Baruch College.